The Watsons is Jane Austen’s first extant draft of a novel in process of development and one of the earliest examples of an English novel to survive in its formative state. Only seven manuscripts of fiction by Austen are known to survive.The Watsons manuscript is extensively revised and corrected throughout, with crossings out and interlinear additions. The manuscript is written and corrected throughout in brown iron-gall ink. The pages are filled in a neat, even hand with signs of concurrent writing, erasure, and revision, interrupted by occasional passages of heavy interlinear correction.... The manuscript is without chapter divisions, though not without informal division by wider spacing and ruled lines. The full pages suggest that Jane Austen did not anticipate a protracted process of redrafting. With no calculated blank spaces and no obvious way of incorporating large revision or expansion she had to find other strategies – the three patches, small pieces of paper, each of which was filled closely and neatly with the new material, attached with straight pins to the precise spot where erased material was to be covered or where an insertion was required to expand the text. According to Christopher Fletcher, Keeper of Special Collections at the Bodleian Library, this prickly method of editing wasn't exactly new. 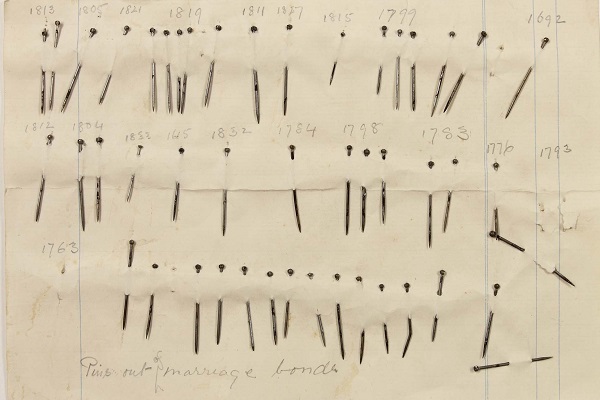 Archivists at the library can trace pins being used as editing tools back to 1617. Eudora Welty also “altered” her writings with pins. There is a documentary of her discussing her method. we love Jane Austen wor too! If you allow us, we present you 27 works of Jane Austen compiled into ten books designed for your reading pleasure on Kindle. Enjoy all of Austen’s wonderful characters, suspense, intrigue and romance, elegantly presented into one file. Does anybody have an explanation for the numbers above the pins? Good question…that was the first thought that popped into my mind.